Turn XLS to XML data files online and for free! Use a XLS to XML Online Converter or get the batch Tool for more! 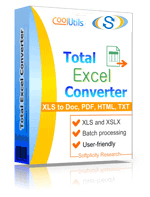 Get Total Excel Converter to convert XLS, XLSX, ODT, XLSM, etc. safely. Total Excel Converter supports almost all Excel extensions: XLS, XLSX, XLSM, XLSB, XLT, XLTM, XLTX, XLK, XLW. When the new Office is released, we will add new file types too. With Total Excel Converter you can convert Excel to PDF and add a digital signature in one go. Total Excel Converter can convert each page of your spreadsheet into a separate file. Tell Total Excel Converter to copy original time stamps if you don't want to change the date. Have an outdated Microsoft Office 2003? Update all your old files to the new format in one go. Convert XLS files to XLSX in batches. Total Excel Converter has a built-in renamer to give your files new descriptive names. Include a counter, a date or worksheet name into the file name and your files will be in perfect order. Convert Excel spread sheets via our most straightforward interface. The widest list of output file types: DOC, PDF, HTML, MHT, XHTML, CSV, TXT, TIFF, JPEG, SVG, RTF, XML, XLS, XLSX, ODS, ODT, Lotus, DIFF, SYLK, LATEX, SQL, DBF, Access! Total Excel Converter can combine several Excel spread sheets into one TIFF or PDF file. Want to quickly find a file? Total Excel Converter helps you to preview any document you select. Add your logo or any other image to the header or the footer of the output file. Want more order? Add page counters or a date to every page of the output files. Sequential numbering of several folders is avaialble. Total Excel Converter can copy original time stamps if you want to keep them. When you convert Excel to PDF you can set user permissions, password-protect your files or sign with a digital signature. Get PDF, PDF/A and non-searchable PDFs. Total Excel Converter can be run via command line (get the ready-to-use command line from GUI). Description XLS is the most popular format for storing table data. It is native Microsoft Excel format with data stored in numbered cells that form columns and rows. The top line and left column of each table contains numbering of each cell that can contain either static or dynamic data that is calculated from formulas. XLS features powerful calculation and charts-building options, as well as rich text formatting. XLS is compatible with numerous table editors such as Calc, PlanMaker, OpenOffice, etc.